THE Shire of Gingin will receive $250,000 from a federal government grant to help it redevelop the Lancelin foreshore. Christian Porter, who is again running for Pearce in the May election, said the redevelopment would result in significant upgrades to Cunliffe and Hopkins streets and the Grace Darling Park area with a view to revamp the aesthetic of the popular coastal town. In June last year the shire closed Grace Darling Park after a gazebo there became unsafe for people to use due to erosion undercutting it. 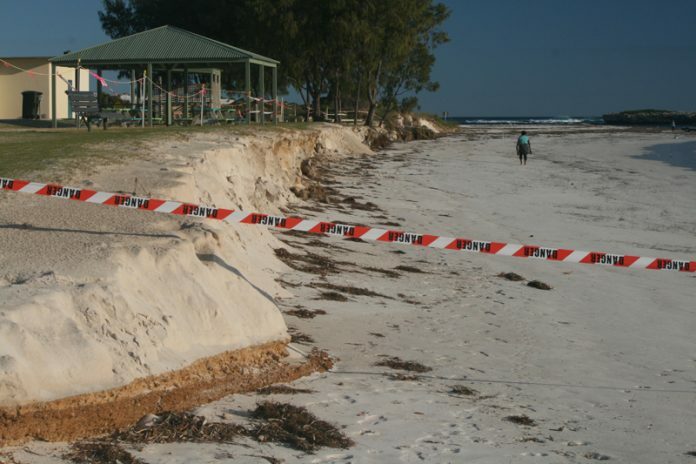 At the time Shire of Gingin President Sam Collard said the council had decided replacing sand where storms had also badly eroded the beach was not a sustainable option and another solution had to be found. Then in August last year Cr Collard said after serious erosion at Grace Darling Park beach access via Edward Island Point remained closed until further notice and access via Hopkins St would also be closed. Cr Collard said a working group made up of councillors and executive staff had met formally to discuss the threat to the public toilets leach drain and septic system. They also discussed quotations from engineering consultants to undertake an assessment and recommend action to stop further erosion. Cr Collard said the erosion face was about 3m away from the public toilet leach drains and there was a real risk of contaminants entering beach water. On Thursday, Mr Porter said the redevelopment project, the funding of which was delivered through the federal Liberal government’s community development grants program, was an important project for the town and would benefit the whole community. “Our government is delivering local investment that our communities expect and deserve,” he said. Shire of Gingin chief executive officer Aaron Cook said the investment would serve to enhance the vibrancy of the town. “This project, coupled with the ongoing upgrade of the Lancelin Caravan Park, will do wonders for tourism in Lancelin,” he said. The total project cost for the Lancelin foreshore redevelopment is $500,000, with the remaining $250,000 coming from the Shire of Gingin. The shire will be responsible for managing the delivery of the project. In June 2016 The Friends of Lancelin Coast said due to the erosion issue the Grace Darling Park infrastructure and lawn should be relocated.